Fall is approaching, but the temperature is still warm enough to have something refreshing. 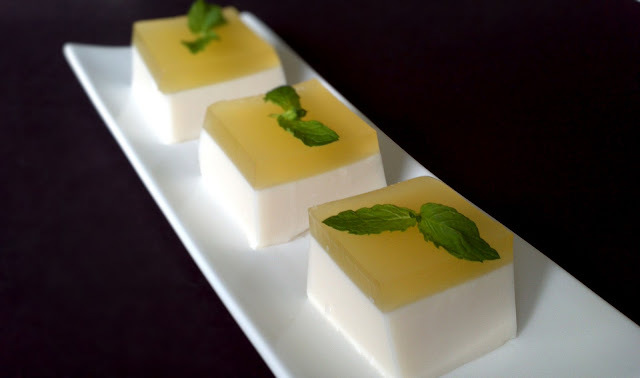 I make this coconut and pineapple jelly quite often. My family loves it. For the pineapple jelly ingredients, I use carton pineapple juice, gelatin and sugar. I had tried to find the pineapple flavored Jello at our local supermarkets but with no success. Anyway, making our own pineapple flavored jelly is not difficult at all. Remember, do not add fresh pineapple to the gelatin as the pineapple contains enzyme that will affect the setting. When making the coconut jelly, always choose a good quality coconut milk. I had bought coconut milk before that tasted like water. You probably don't want to use that. Always stick with the kind that has a creamy and thick texture. Sprinkle one envelope of gelatin over 1/4 cup of water and dissolve. In a small saucepan, bring pineapple juice, sugar and 1/2 cup of water to a simmer over medium-high heat. Add gelatin mixture to the pineapple juice mixture, stir and bring the mixture to a boil. Pour the mixture into a 9"X 5"X 3" non-stick loaf pan. Chill until firm. Sprinkle two envelopes of gelatin over 1/2 cup of water and dissolve. In a saucepan, bring coconut milk, sugar and evaporated milk to a simmer over medium-high heat. Add gelatin mixture to the coconut milk mixture, stir and bring the mixture to a boil. Pour coconut gelatin mixture over pineapple jelly before coconut gelatin mixture is formed and when the pineapple jelly is set. Dip the loaf pan into hot water for 30 seconds. Invert the jelly onto a plate. Cut into squares and serve.